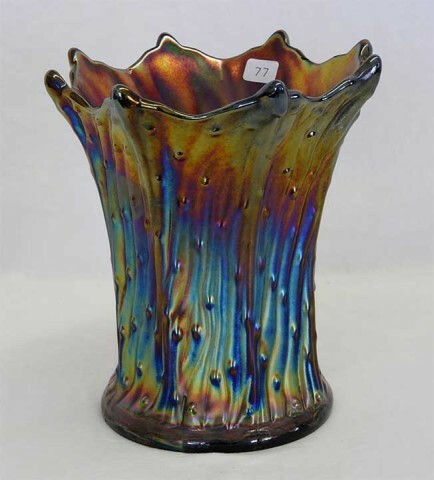 This extraordinary vase is in purple and has a base diameter of almost 5 inches, which puts it in the category of a funeral vase. Not much is known about it, but thought to have been made by Dugan. 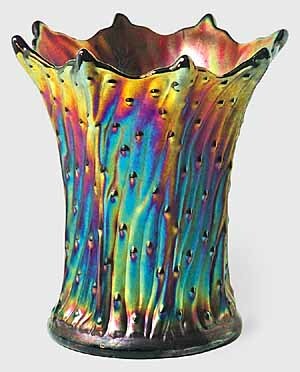 It has a 8 3/4-inch flare at the top, it is just 6 inches tall. Carl O. Burns reports they are also known in marigold, peach opal, and green. 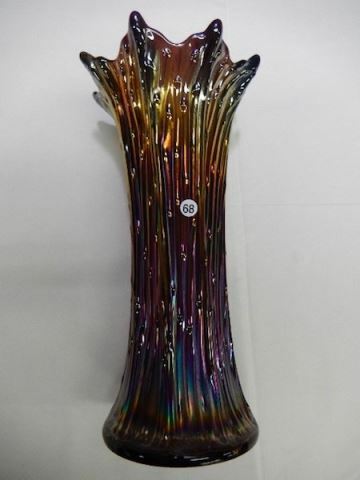 A purple example, 8 inches tall, sold in 2002 for $5,200 and another in purple, swung up to 11 1/2 inches, sold for $2,025 on eBay in 2004. In 2007, a 7 1/2-inch amethyst example, with a silvery exterior, sold for $2,600: in 2010, the same 7 1/2-inch example sold for $3,150.